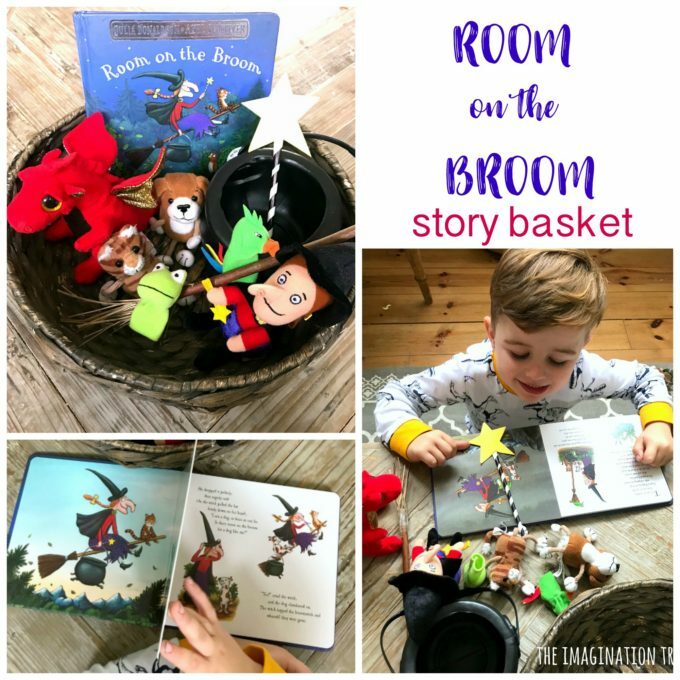 Make a Room on the Broom Story Basket for play literacy time with young children! 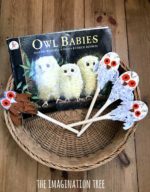 Perfect for retelling a favourite story in a fun and tactile way, using adorable story props as aids. 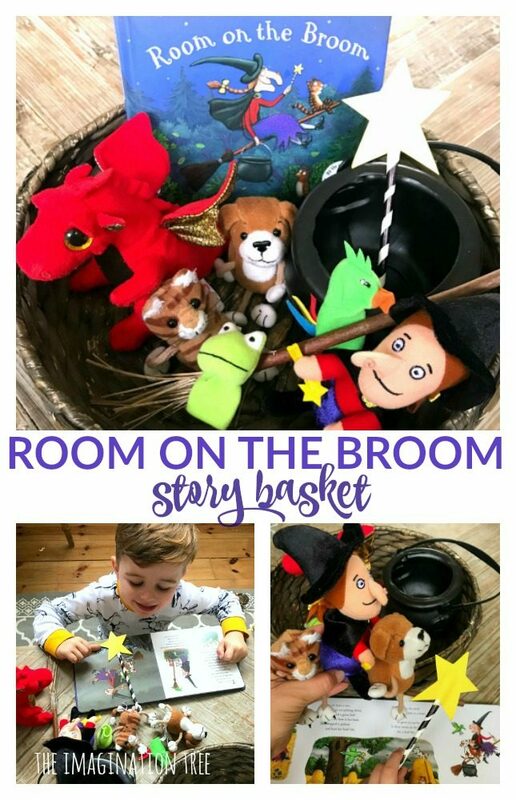 Story Baskets and storytelling props are fantastic ways to encourage young children to develop their story telling language, recount main events in the right order and talk about characters and events from their most loved books. 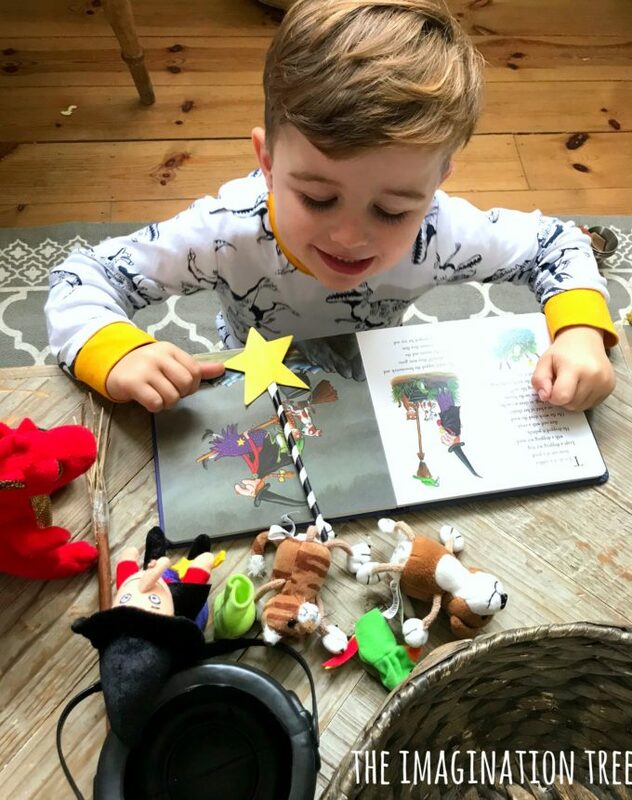 Children often fixate on a few absolute favourite stories which they learn off by heart, or can at least join in with the repeated refrains easily when being read to. 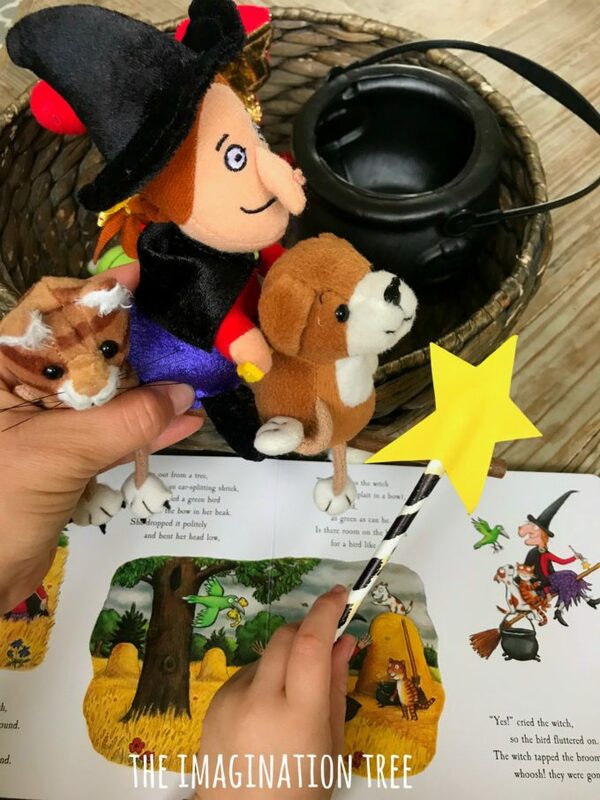 These are fundamental pre-reading skills and should be developed as much as possible by building up a range of fun playful storytelling sessions together! If you want to hop right to my PLAYFUL STORYTELLING archives for a huge range of ideas to get you started, you’ll find plenty here! 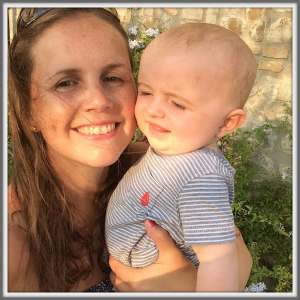 And please do read this post I wrote about the importance of RHYMING books and nursery rhymes in language development too. Here are 50 of the best rhyming stories for kids to get you started! 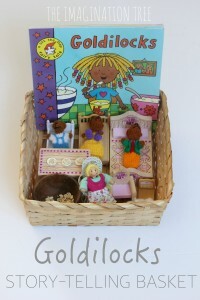 Add them to your little one’s birthday or christmas list for relatives to buy! It’s been quite a while since we made a story basket and, as if often the case with youngest kids, poor Mr 4 hasn’t had as many resources made for him as I made for his big sisters! 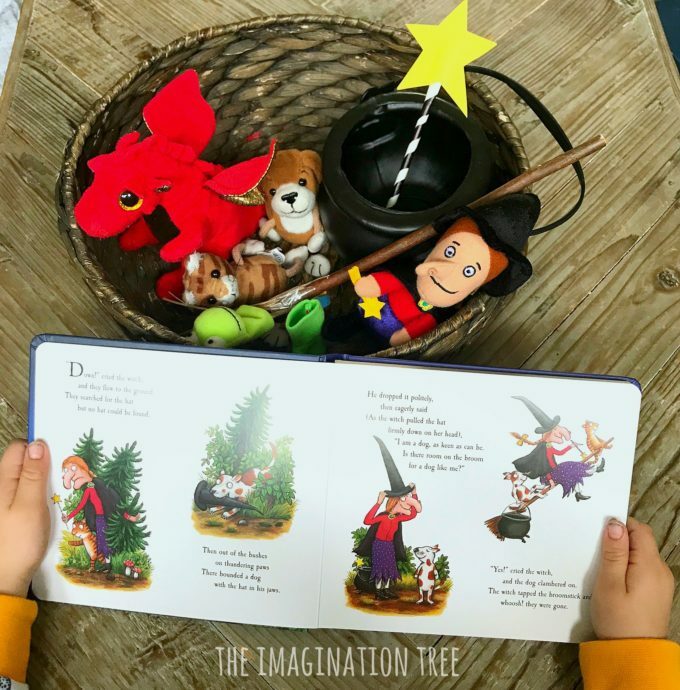 He absolutely loves the Julia Donaldson classic Room on the Broom so we assembled some resources to make this Room on the Broom Story Basket together. 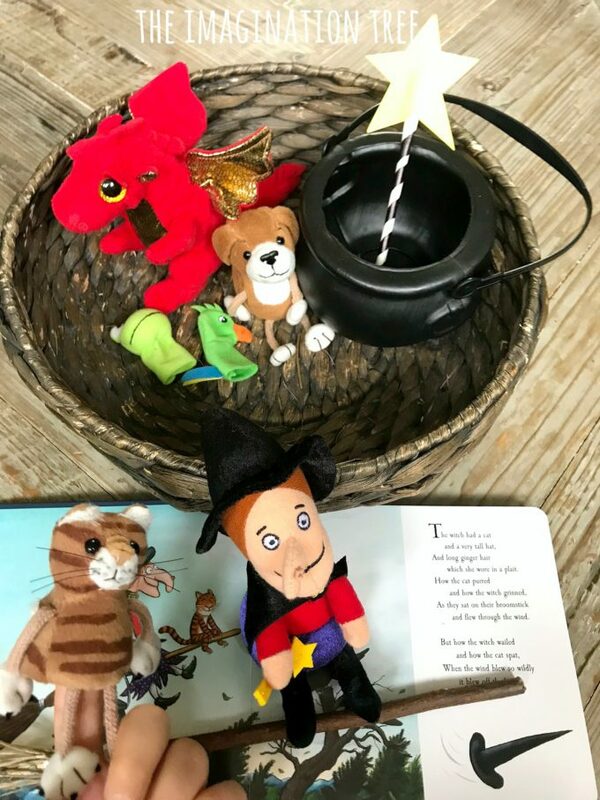 We simply arranged all of the main characters and props in the basket, along with a copy of the book, ready to read and play. The broomstick was made sing a twig and some smaller twigs, attached with sellotape. The magic wand is simply a paper straw with yellow card cut into a star shape stuck on top. 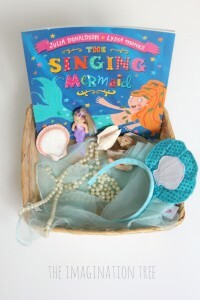 My usual way of using story baskets is to firstly tell the story. I wait to see if they want to grab any of the props of puppets out as the story goes and they interact with them however they wish. Then we read it again and usually I model taking out each item at the right point in the story, acting out the events or making the characters say dialogue from the book. They then join in and quickly take over this themselves, doing it in their own way. If they are very familiar with the story they may well be able to use all of the correct language too, especially if it’s repetitive. 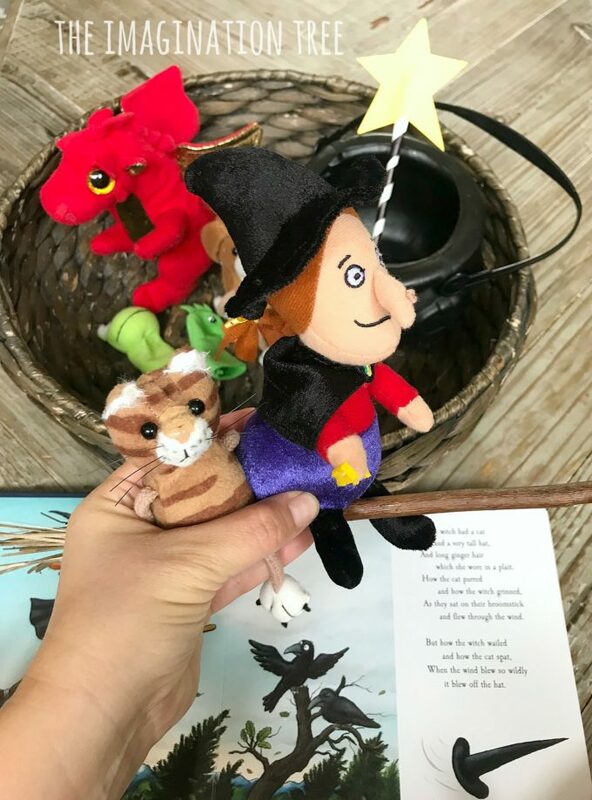 He was able to join in with “is there room on the broom for a … like me?” and also pointed out what was happening at each stage, predicting which animal would join the broomstick next. 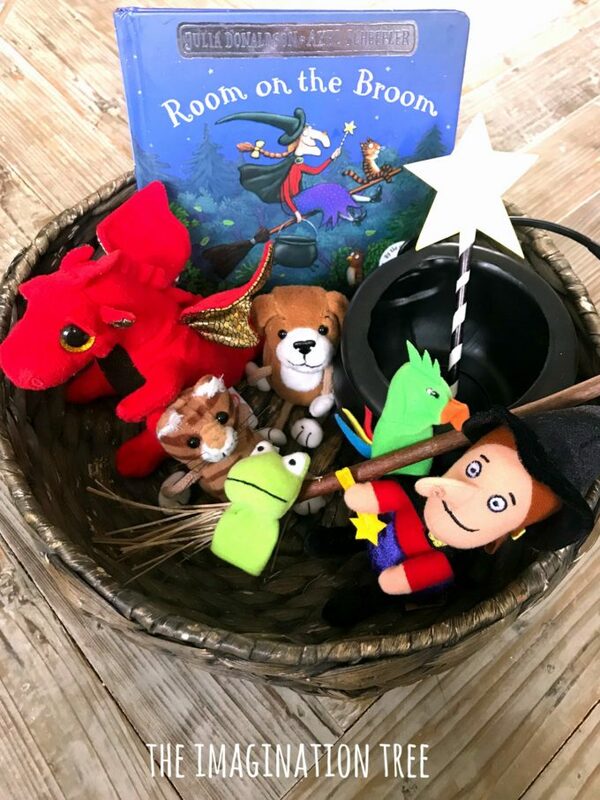 After the first few uses of a story basket I then place it at an accessible level, usually a low shelf or table top, and children come and go to use it independently over the following week or so. When they use it alongside other children, especially older children in a sibling or friendship group, they can have the language and storytelling skills modelled to them again and again until they begin to repeat this for themselves. 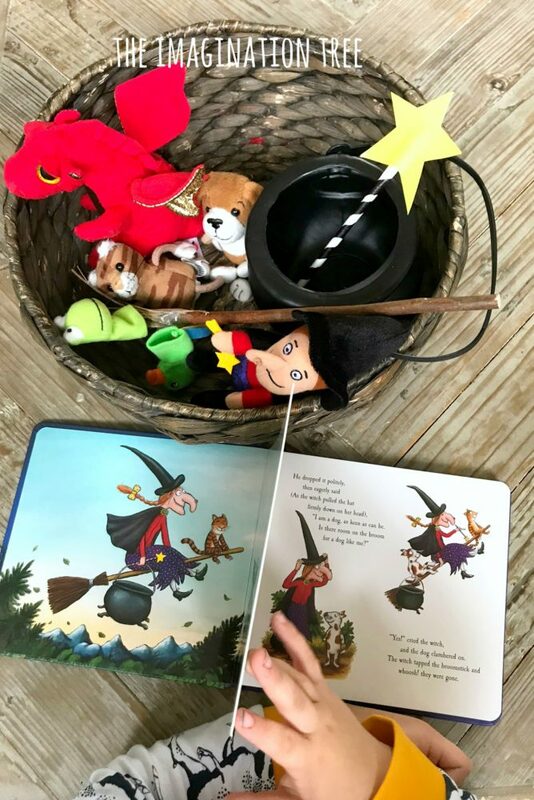 It’s for this reason that story baskets and similar types of story telling props are so powerful in the development of early literacy skills. Every teacher, homeschooler and parent should have story activities accessible as often as possible wherever possible! 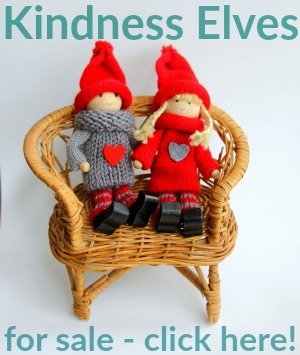 Here is a quick link to our STORYTELLING ARCHIVES again for lots more inspiration! Or jump right to these 12 Storytelling Ideas in this post! And here are our other STORY BASKETS we have made over the years. 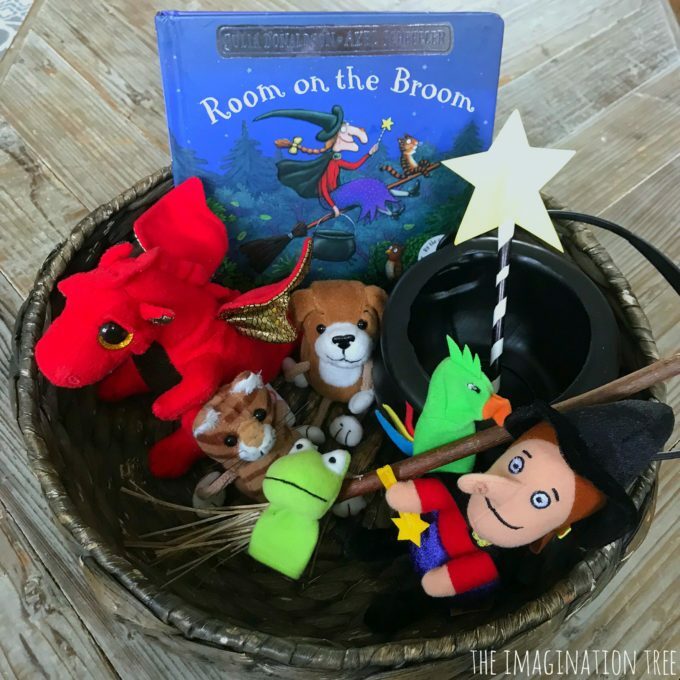 If you loved this Room on the Broom Story Basket please do consider sharing it with others or leave me a comment! It’s encouraging for me to hear from you. Thanks! I love this idea! 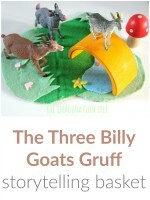 Not only to encourage imaginative play but also to practice sequencing and retelling! 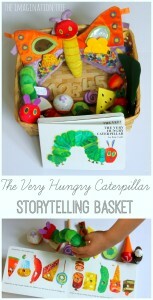 Thank you for this creative way of using a book with preschoolers! You can add on to these ideas by asking your child to change the ending of the story and consider alternative endings discussing cause and effect.